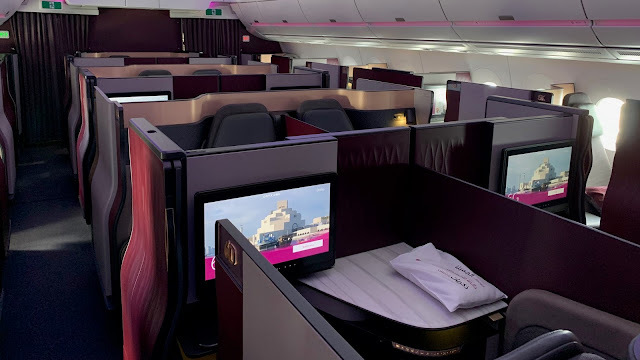 *Qatar Airways sells their business class seats as first class seats when flying within the region so this flight was actually in business clas. My flight from Kuala Lumpur to Doha landed on time and since I haven't received my boarding pass yet for my Doha-Dubai flight, I decided to stop by at one of the transfer desks. After receiving my boarding pass for my next flight, I went directly to the Al Mourjan Lounge but not without gazing first at this marvelous centerpiece. I heard that this teddy bear belonged to the Royal Family and that it costs million of dollars. Boarding started on time at gate B2 and since I needed to check in my luggage, I asked one of the agents to help me and after getting help from her supervisor, all went well. The reason for this was I had to meet a friend in Dubai and it would be easier if I only had a knapksack with me. My seat 2A was a window. As for my pre-departure beverage, I had a glass of water. Hot towels were also offered as well as newspapers. As soon as boarding was completed, the captain came on the PA and welcomed us onboard informing us of our flight time of 50 minutes. I was also offered arabian coffee and it was actually very good. The service was very efficient and after a few minutes, we were airborne. I also had a chance to take a picture of the Doha skyline which looked awesome. Since the flight was very short (less than an hour) the meal service started immediately and I have to commend the purser and the male cabin crew for a very efficient and great service. The cabin was almost full and almost everybody had ordered something and yet the service was exceptional. Of course, the food was also excellent. After the meal service, Fast Track cards were distributed. We landed at Dubai International Airport a few minutes after the scheduled time and as a premium passenger, I was one of those to disembark first. For a very short flight, I didn't expect that the meal service would be perfect but it turned out we had a great crew on board and everything went well. The purser made it sure that all the meals ordered were served on time and the male crew working in the galley was just as awesome. I was also addressed by my name which was very much appreciated. If there was one little thing I could comment on, it was probably the boarding music which I thought was a bit too loud. Otherwise, it was a perfect flight. To all the crew on this flight, Shukran!